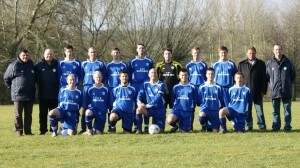 SoccerNews.com is very happy to be a sponsor of English non-league side Wilton Town. The team is managed by our feature writer Graham Fisher and is making good progress after being formed in the Summer of 2008. Wilton is a small town in Wiltshire with a population of under 5000. It is just a couple of miles down the road from the larger city of Salisbury and only ten miles from the famous world heritage site of Stonehenge. The town can trace it’s history back to at least the eighth century and is probably most well known now for being the home of the Wilton House stately home and of the Wilton carpet factory. Although there are records of a Wilton FC dating back to 1902 it seems that a reasonably high standard of the game had not been played in the town for many years prior to 2008. That Summer, local man Ian Lindsay, who was an experienced local league manager, was approached by local businessmen to form a Wilton Town side. Lindsay brought in Tony Craven and Graham Fisher to assist with the management and coaching of the new side. The team were entered into the Wiltshire Football League who’s Premier League stands at step seven in the English non-league pyramid. Wilton Town were placed in Division Two, effectively step nine. This was an ambitious move by the club as there were many lower leagues that could have been approached, but showed the forward thinking of the people behind the club. The first season 2008-09 saw Town have a very difficult start. The team was put together and contained few players who knew each other prior to the start of the season. Many of the players were playing at a level above that which they had played before and they found it tough. Behind the scenes, Ian Lindsay became the General Manager of the club whilst Tony Craven moved on. That left Graham Fisher as the first team manager and he was fortunate to be able to bring in three or four players who raised the standard of the team and started to turn results around. At the end of that first season Town finished in mid-table and hopes were high for the future. The first team went on to win Division Two of the Wiltshire League and gain promotion in just their second season. With a reorganisation of the Wiltshire League the 2010-11 season will see just two divisions, the Premier League and Division One. Town have applied for, and been successful in being accepted into the Premier League. This means that Town will be playing at step seven of the non-league pyramid. The five year plan for the club sees them looking to be in a position to move up to step six and this will involve a great deal of work and expenditure on the home ground at Castle Meadow and will be a massive test for the playing staff. The coming season will be one of consolidation as Town will need to establish themselves at a level two league higher than they played last season. Graham Fisher is well aware of the tough test they face.